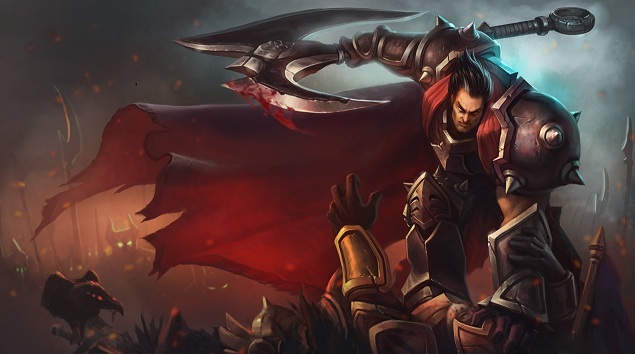 Darius is the newly added Champion in League of Legends. Darius is here to destroy the enemy heroes and punish them towards hell. Darius mainly focuses to initiate battle who provides a great luxury for the allies to strike opponents from his back. Darius is carrying some outrageous spells which will drive you crazy. You can check out the rest of the guide and spotlight video. Darius’ basic attacks and damaging abilities cause enemies to bleed for 12 / 15 / 18 / 21 / 24 / 27 / 30 / 33 / 36 (+0.4 per bonus attack damage) magic damage over 5 seconds, stacking up to 5 times. Darius gains 5% movement speed for each bleeding enemy champion. Darius deals (70 / 105 / 140 / 175 / 210) (+(0.7 per attack damage point)) physical damage to all nearby enemies in a circle around him. Champions in the outer half of the ability are struck by the blade, taking 50% additional damage, (105 / 157.5 / 210 / 262.5 / 315) (+(1.05 per ability power point)) Maximum Physical damage. Darius’ next basic attack deals (12 / 59 / 106 / 153 / 200)% additional damage and slows the target’s movement and attack speed by (20 / 25 / 30 / 35 / 40)% for 2 seconds. Crippling strike’s cooldown is reduced by 1 second for each stack of Hemorrhage on the target. Darius hones his axe, granting him passive armor penetration. When activated, Darius sweeps up his enemies with his axe’s hook and pulls them to him. Darius leaps to target enemy champion and strikes a lethal blow, dealing (160 / 250 / 340) (+(0.75 per attack damage point)) true damage. For each stack of Hemorrhage on the target, Noxian Guillotine deals an additional 20% damage, (320 / 500 / 680) (+(1.5 per attack damage point)) The cooldown is refreshed if Noxian Guillotine kills the target. We wish that fans would love to play with this amazing Champion Darius. Have fun playing with Darius..